We’d love your help. Let us know what’s wrong with this preview of Underground by Suelette Dreyfus. To ask other readers questions about Underground, please sign up. I found this one to be a very entertaining read. Firstly, being one with a strong IT background I expected to quickly feel "at home". Secondly, and perhaps even more importantly, I was very much hoping to "relive" my personal experiences with the "early" (inter)net - to be confirmed in my own perceptions if you will. Then was time when you could still snoop around the net openly without second guesses and immediate fear of persecution - ultimately with a wish to simply learn as the driving force I found this one to be a very entertaining read. Then was time when you could still snoop around the net openly without second guesses and immediate fear of persecution - ultimately with a wish to simply learn as the driving force beind your doings. With regards to the book, everything that Dreyfuss writes about appears authentic to me, online BBS, the "holy grail" themed search for secret bug mailling lists and the at times nearly friendly toying of Hackers and Admins with one another all seems familiar. The general idea of what actually makes a "hacking person" (contrary to a "cracker") is also conveyed clearly and should only serve to teach the reader to distinctly draw the line between the "good" and the "bad" hackers. Dreyfuss also focuses alot on the personal lives and inner struggles found in most of the youthful hackers featured in her book, which only serves to make the book more entertaining and believable. When a nationwide wanted for hackings teenager falls in love with a girl and goes through all the states of happiness on to heartsickness it never feels fake or uncinsere. After all, even hackers are only humans - the book brings that integral message across very nicely. 2/5 - It was ok. I’m fascinated by stories like this, but the way that the stories were presented in the book resulted in a combination of perseverance and dread. The stories are overall entertaining and intriguing if you’re interested in history like this. Unfortunately, Dreyfus includes a lot of unnecessary information. I assume that Dreyfus included the additions to facilitate a better understanding of the characters. Unfortunately, on some of the characters the additional information does no 2/5 - It was ok. I’m fascinated by stories like this, but the way that the stories were presented in the book resulted in a combination of perseverance and dread. The stories are overall entertaining and intriguing if you’re interested in history like this. Unfortunately, Dreyfus includes a lot of unnecessary information. I assume that Dreyfus included the additions to facilitate a better understanding of the characters. Unfortunately, on some of the characters the additional information does not add much to the psychological profile and makes reading a chore. Part of this feeling of unnecessary information is probably due to the way that Dreyfus organized the material. Stories jump all over the place instead of flowing in a coherent manner leaving the reader with the feeling of “ummm, why am I reading about a different time period in this characters life all of a sudden? This isn’t a movie flashback.” Dreyfus was obviously attempting to pull in additional back story to provide some context for the behavior of the characters, but in the end I think it detracted from the multiple story threads. I love these glimpses into the minds of hackers and how everything worked before the Internet. Sharing, openness and then changes coming with new laws brought on by few "black sheep". Writing a book on hacking, computer security, and so forth is hard. When this was written, back in 1997, it was surely even harder, as the general audience this book is aimed at was presumably less familiar with the technical details of "cyberspace." Dreyfus manages to make it work and capture a snapshot of the feel behind some of the (primarily Australian) hackers she features in the book. I read this from a PDF that's freely available on the book's website; it was presented in a fixed-width, ty Writing a book on hacking, computer security, and so forth is hard. When this was written, back in 1997, it was surely even harder, as the general audience this book is aimed at was presumably less familiar with the technical details of "cyberspace." Dreyfus manages to make it work and capture a snapshot of the feel behind some of the (primarily Australian) hackers she features in the book. I read this from a PDF that's freely available on the book's website; it was presented in a fixed-width, typewriter-seeming font -- the sort of font that you'd use to read most electronic text from the 1990s, and eschewed much typography or layout (again, like you were reading an ASCII text from that period). This may have made it worse, because Dreyfus kept interrupting her own timeline to include anecdotes or brief timejumps about the subject of each chapter. But with no sign that the timejump occurred, the writing felt disjoint and bizarre, irrelevant details complicating what should be straightforward description of what happened. I read the first 200 pages or so quickly, before it got to the chapter on Assange ("Mendax"). He apparently helped edit the text (he is listed as a contributor here on Goodreads); it was there that, whether it was simply seeing how the text glissed over attributes that more recent profiles of Assange have focused on, or wondering how much of this chapter has been glamorized, that I felt like it became a captive to the "hacker" view. In den ersten Kapiteln tauchen in sehr kurzer Folge sehr viele neue Figuren auf, die kaum eingeführt werden. Das verwirrt etwas, und man verliert schnell den Überblick. Spätere Kapitel drehen sich meist nur noch um wenige Personen. Einige wenige Stellen in der Dokumentation sind recht langatmig, vieles ist aber wirklich spannend zu lesen, selbst wenn man schon eine Reihe anderes Material zum Thema "Anfangstage des Hackens" gelesen hat. Das Buch liest sich flüssig, die Übersetzung ist gelungen. You might be interested to read this book, when you learn, that Mendax, one of the teenage hackers, is Julian Assange. Pretty interesting book about the hacker subculture of the late 80s and early 90s -- in Australia. Yes, the smallest continent, a land that for a time had a _single_ T3 cable serving the entire nation, had a thriving hacker community. Who knew? The stories are pretty much the same as every hacker story everywhere: a bunch of nerdy aspie teenage guys stay up late at night making their way through the local telephone company computers. From there they access universities, and from there they visit Pretty interesting book about the hacker subculture of the late 80s and early 90s -- in Australia. Yes, the smallest continent, a land that for a time had a _single_ T3 cable serving the entire nation, had a thriving hacker community. Who knew? The stories are pretty much the same as every hacker story everywhere: a bunch of nerdy aspie teenage guys stay up late at night making their way through the local telephone company computers. From there they access universities, and from there they visit corporation mainframes and network clusters -- all for the simple joy of finding out how they work. As with all hacker stories, the general arc is the same: someone brags about the hacking they've done, the federal police investigate, the cops make several "burst through the door with stun grenades" arrests, someone turns state's evidence, some hackers go to jail. But as always, the story is in the details, and the details of this book make it an interesting bit of hacker lore. This is just too short. There are a few cases in it, but there isn't really a whole picture (and I'm pretty sure there was enough material to paint it). The people described in the book are exemplary of the field, but that's really not enough. The book is also a nice description of Julian Assange (aka Mendax), who also helped with it (so, the usual grain of salt applies). There are definite Assange undertones to this book. But it is also a tale told from the perspective of the hacking community in the 1980s. The flavor, of the atmosphere and the taste of the character's naiveté definitely struck a chord when I read this in the late 90s. Although it's supposed to be a mostly true story, you can tell it contains some embellishments for the sake of the story, and the subject's privacy. All in all a well rounded book. I have never gotten through a book faster than this. You might think a book about hacking would be boring, but the chapters are all well told. And the book today is more pertinent than ever, as hactivism has pushed its way into public discourse. Assange writes the forward, and is now public enemy number 1. You don't need to be a tech person to understand the book--a huge plus. Best part of all, it's free. a re-read from many moons ago, and enjoyed it rather more first time round. it's much better at giving insight into the personalities involved and their motivation, than it is at providing a quality reading experience. but the former is sufficiently interesting that the book doesn't suffer too much for it. Interesting nostalgic read. I remember the time and some of the people mentioned. Oh, the days of the Commodore 64 and the even more wonderful Amiga. After a rather slow and laborious beginning, delving into the not too interesting details of the attack on NASA, I became more engaged with the lives of the hackers and Ken Day and his colleagues' under-resourced campaign to bring them to justice. An account of hackers and their underground world. Tells the story of Par, a hacker that was on the run from the US secret service, and of Julian Assange's hacking days in Australia, among other stories. A must read for piecing together a history of computer hacking. Assange helped with the book and wrote the preface. I'm a geek by trade, and the reason I stumbled into my line of work is that I've always been highly fascinated by communications networks. 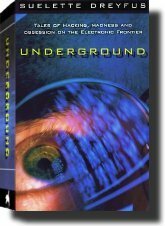 Underground deals with some of the early history of hacking, which might be an acquired taste, but for those of us interested in the field it's an interesting and engaging read. I lived through this time and was involved in this community. Some of these names are familiar to me so it holds a special nostalgia. I'm taken back to the days of 2400 baud modems and Bakelite handsets placed into foam seats. An excellent tale very close to home for me. A nice, compelling story about a couple of hackers in the late eighties and the early nineties. I also read "Inside WikiLeaks", in which someone calls Julian by the name Mendax. Could it be that Mendax in the Underground book is Julian Assange himself? Or this just an easter egg? This was fascinating. Well written, compelling, a fantastic history of the early 1990s hacking culture and such an interesting insight into the opposing forces that are shaping the online world today. Tops. Although the topic is interesting, the book is too big for its content, delves into lots of personal details, and is not perfectly written. Best chapters were 1, 4, and 5, and if a summary happens to be provided for the rest, those three chapters would make a good read. Das Buch war wirklich interessant, besonders wenn man bedenkt das vieles was im Buch beschrieben ist, zu einer Zeit passiert ist, wo Internet und Computer in den Kinderschuhen gesteckt hat. Zu sehen, was damals schon alles möglich war oder vollbracht wurde, ist wirklich erstaunlich. Engaging read, if you've ever wondered how hackers came to be and how technology has progressed over time. Admittedly, as technology progresses, so do the various kinds of personalities who engage in hacking. Every wannabe geek should have this and read this book. one hacker mentioned in this book is Assange itself and say what.. the book reveals that the author security guru clifford Stoll (author of "cukoos egg") got hacked... which makes us laugh along with the h hackers... one hell of a read.. This is a really well written and researched book. I could hardly stop reading this. It made me wish I was a little bit more computer-literate, which would probably allow me to understand more of the finer points of the story. Still a great read though. Published nine years before WikiLeaks came online and all the more thought-provoking as a consequence. Fascinating for techies, I think those of a less geeky nature would enjoy it more than they might anticipate. Available as a legitimate free e-book from Project Gutenberg. Somewhat chauvinistic and sometimes repetative but had some great moments and was a fun read. It had a nice balance between technology and story, much better than in some other hacker memoirs I've read. A book about the 90's hacking world, partially written/contributed-to by Julian Assange.